» Why Did the Heat Abandon Their Game Plan on Defense? At halftime of Game 1 on Tuesday, the Miami Heat led the Oklahoma City Thunder by seven because of a strong defensive showing. The Heat held the Thunder to 22 points in the first quarter, trapping the Oklahoma City ball handlers on pick-and-rolls, forcing turnovers. 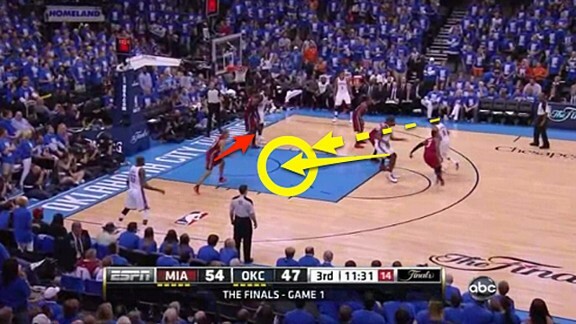 Late in the second quarter, though, the Thunder began to figure out how to beat the Heat defense. They began passing to the screener, specifically Serge Ibaka (which is what I suggested in my preview). 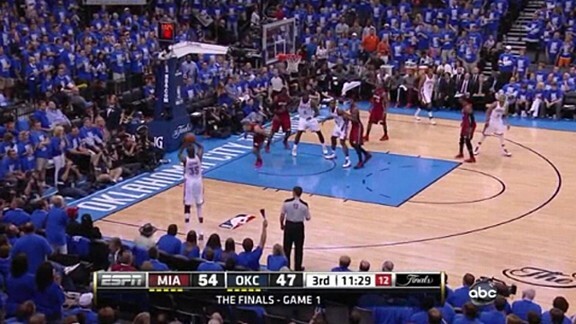 In each of the possessions above, Ibaka makes the catch off a pick-and-pop (or with a short roll to the rim). Because his man is part of the trap, he has plenty of space to make a strong move toward the basket. Ibaka has not been shooting well throughout the playoffs, so having him dribble into the space provided and attack the rim was a smart way to get him going. Thunder coach Scott Brooks went right back to this strategy to start the third quarter. On the Thunder’s first possession of the second half, Ibaka sets a ball screen for Russell Westbrook. 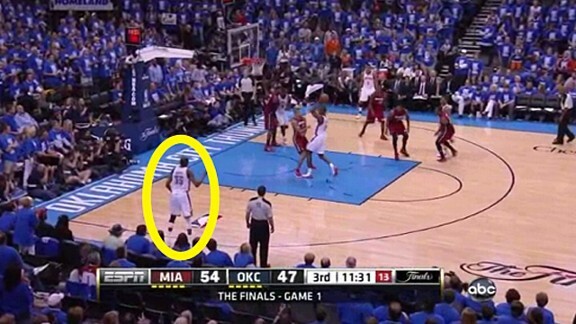 Miami traps Westbrook, with Dwyane Wade working over the ball screen and Udonis Haslem leaving Ibaka. 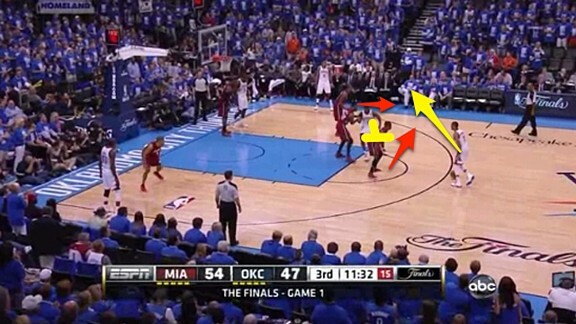 As the Heat trap Westbrook, Ibaka turns and rolls to the middle of the paint instead of to the front of the rim. Shane Battier leaves Kevin Durant to help. If Ibaka had gone all the way to the front of the rim, he would have run into the defense, but a short roll means that he will be open. Ibaka makes the catch in the middle of the paint, knowing that Battier is on his way because Miami always sends help from the corner. The Thunder were capitalizing on Miami’s poor rotations. Look at LeBron James on this play. He should be the defender rotating to Ibaka rather than Battier, which would leave Kendrick Perkins open, opposed to Durant. Instead of adjusting their rotations, coach Erik Spoelstra and the Heat panicked. Instead of sticking with their traps and forcing Ibaka to make plays, they started switching on every ball screen. If there is one thing that Miami has been consistent with since Spoelstra took over, it has been their traps. Why abandon it now? On this possession, Ibaka sets the screen with James covering him. As soon as Westbrook comes off of it, the Heat switch, with Wade moving to Ibaka and James moving to Westbrook. On the switch, Westbrook gets a little cushion that he takes advantage of to get to the front of the rim for a layup. By relying on switches, the Heat went from aggressive team to passive, reacting to the Thunder instead of dictating play. On these three possessions above, the Heat get beat in different ways. On the first possession, the Heat switch a Westbrook-Durant pick-and-roll, and as the ball quickly goes to Durant, Wade is out of position. On the second, Durant is the ball handler on a very high ball screen. Instead of trapping him to stop his momentum, the Heat switch, allowing Durant to drive at Battier at full speed, getting to the rim and creating for his teammates. Finally, in the last possession of the third quarter, the Heat try to switch a ball screen with Westbrook as the ball handler, but are very lazy about it. Westbrook sees space in the middle, splits the defense, and gets to the front of the rim for an and-1 that gives the Thunder the lead going into the fourth. 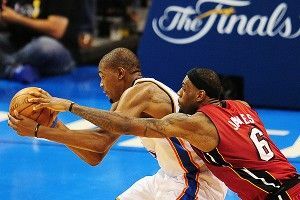 After the ball screen, James defends Nick Collison on the inside while Chris Bosh defends Westbrook on the outside. When Westbrook kicks it out to Durant on the wing and he attacks, both James and Bosh are in uncomfortable positions to help. Bosh doesn’t know how to help from the outside on dribble penetration, and James isn’t used to being the big coming over and helping on the weak side. As a result, Durant gets an easy layup and the Thunder extend their lead. This change in defensive philosophy from the Heat is unusual; they rarely change how they handle pick-and-rolls. The Heat’s switches appear to be a direct result of Ibaka making plays against them. In the second half, Ibaka played just eight minutes and Collison played around 13, meaning Collison was the primary screener. Why not see if Collison can make the same plays that Ibaka did? Trap the ball hard and funnel it to Collison. Make him the playmaker instead of Durant or Westbrook working on a mismatch. If I’m the Miami Heat, I go back to trapping ball screens right off the tip in Game 2.